Most research has focused more generally on assessing college students’ identity statuses, development trajectories, and how individual’s sense of identity is associated with various outcome variables. There is little research about the process of racial and ethnic identity development. The ICT has been used to study the identity micro-processes of several different identity domains, such as career identity, moral identity, and individual’s self-concept. 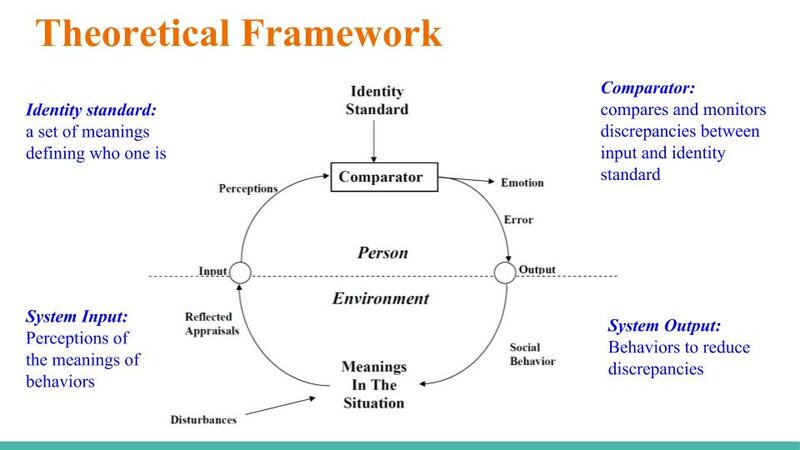 It suggests the identity process operates as a self-regulating control system that works to reduce the discrepancies between the meanings held in one’s identity standard and the meanings perceived in a situation. It has not been used to study racial and ethnic identity development. Previous research have explored "critical" experiences that contributed to college students' racial and ethnic identity. However, it remains unclear what made the incident “critical” and how the identity process plays out in those incidents. The findings of this study will provide insights on the identity process within the individual and more clues about how specific actors or experiences contribute to individuals’ racial and ethnic identity. Results from this study also can extend the theory substantively by providing empirical knowledge and evidence for future applications of ICT and forming the basis for a follow-up investigation exploring how individuals’ racial and ethnic identity changes on a daily basis as they interact with others. This qualitative study is a first attempt to apply ICT to study racial and ethnic identity development. Using a narrative interview protocol, I will ask participants to recall and share at least 3 experiences that they think were critical to their racial and ethnic identity. 20 individuals and 3 experiences from each individual will give me enough data for achieving saturation. The theory suggests that different domains of identities operate similarly. It is hypothesized that racial and ethnic identity will follow the control system that ICT suggested. I will use a hybrid combination of inductive and deductive coding. Inductive coding is used to explore the data; deductive coding will be used to "test" the hypothesis. I would love to interview more students to increase its validity and also have some funding to cover transcription cost. With the time constraints, I will use an online transcription service to transcribe all interviews ($265 is the expense for transcribing all interviews). A larger sample size will allow me to interview enough individuals to get sufficient data for saturation. This qualitative study is the foundation of a bigger quantitative study. I will calculate the probability of one experience identity disturbance, defense and change (main components of ICT) and use them to calculate the sample size needed for the quantitative confirmatory study. Pauline is my graduate student; she has designed this project to complete her M.S. degree in Educational Psychology. Other researchers have documented how a positive sense of identity fosters success among first-generation college students and students from under-represented groups on campus. As yet, no one has investigated how a positive identity develops in college. This innovative, theoretically grounded study will give us insights into how we can assist students in developing an identity that will promote their success in college. We will recruit and interview 20 participants in February. We plan to complete data analysis by May. We intend to share results in August. All parts of the project will take place in 2019. Data analysis consists of both inductive and deductive coding. I will take an inductive approach to explore the data, and look for patterns in the data using thematic analysis. Then, deductive coding consists of formulating a coding scheme based on the literature on ICT. Hi, my name is Pauline Ho, a second year PhD student in the Human Development area of the Educational Psychology department at the University of Wisconsin-Madison. My research focuses on understanding the process of achieving a coherent sense of identity among college students of color. In addition to research, I have a variety of experiences working with students, including peer mentoring, scholarship advising, and academic tutoring. It's Fully Funded! THANK YOU!! !